Product code: ES7548 Categories: Sold Items, Sold Rings. There is something so special about a genuine antique diamond engagement ring adorning your finger, and here is a very beautiful antique 5 stone diamond engagement ring from the 1890’s that will always be loved and cherished. 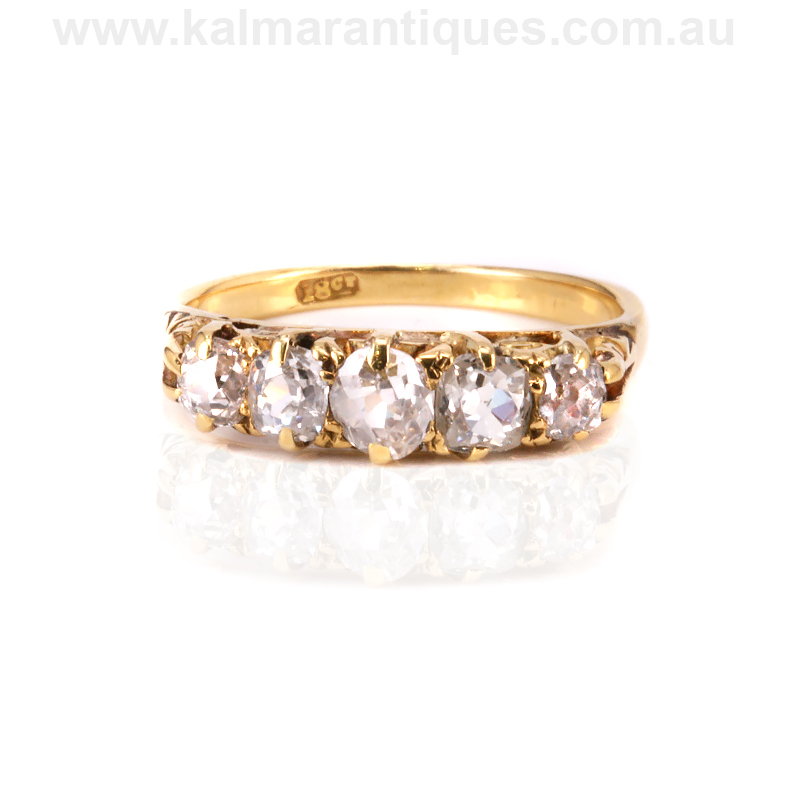 Hand made in the late Victorian period of the 1890’s, this ring is set with five mine cut diamonds. Mine cut diamonds are also known as old miners or cushion cut diamonds as they have a somewhat cushion shape to them and remain one of the most popular and sought after antique cut of diamond. These five mine cut diamonds total 1.06 carats and are G in colour and Vs to Si in clarity and from one side across to the other, this distance measures 17.6mm by 5.2mm wide at the centre. On its own or sitting along side a wedding band, there is no doubt that this antique diamond engagement ring will continue to be loved and cherished for a lifetime. 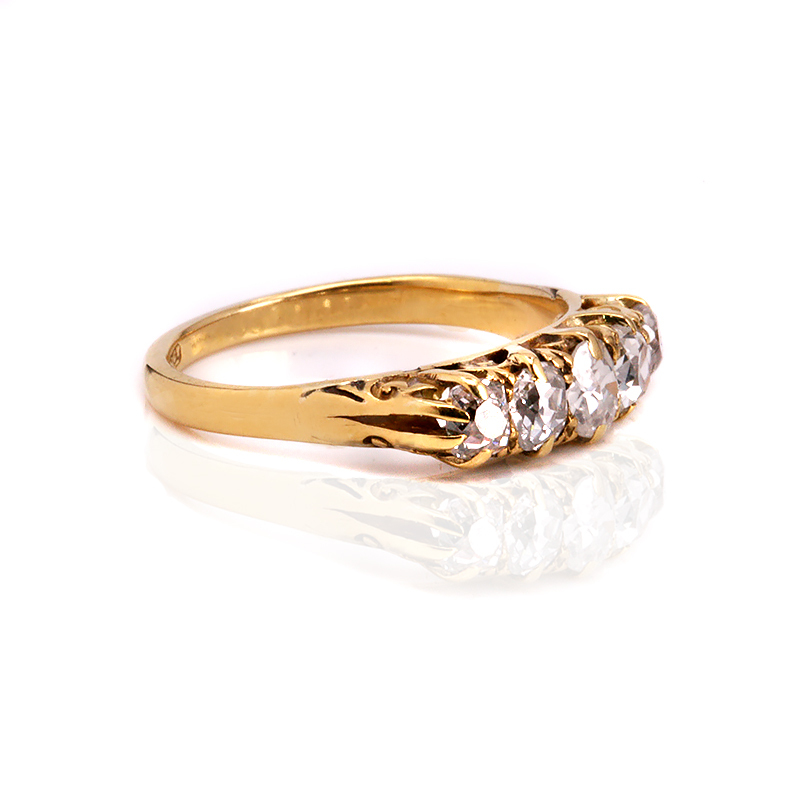 Antique 5 stone diamond engagement ring from the 1890’s hand made in 18ct yellow gold. With lovely scroll work on the side of the ring, this shows the attention to detail that could be created by a master jewellery over a century ago. Set with mine cut diamonds, this was a forerunner to today’s round brilliant cut diamond. Also known as mine cut diamonds or old miners, they have a fabulous cushion shape to them and all the charm and character of being cut by hand all those years ago. The five stone diamond engagement ring has been a traditional style and design for centuries and most popular in the late Victorian period all the way to today. Allowing it to sit across the finger, they always look so elegant on their own or set along side a wedding band. This traditional style of antique engagement ring is one that has never gone out of fashion or style and is as popular today as it was centuries ago.